How Do Vegans Make it Through the Holidays? This is a wonderful article written by Meikmeika, she has a really awesome blog were amongst her other interests she blogs about food, specifically vegan cooking. Eventhough I am not Vegan, I love the creative dishes she comes up with. 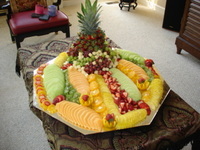 They are healthy and simply yummy to look at. So this posting is for Vegans and non-vegans to enjoy. There are quite a few things on Meikmeikas list that we can incorporate into our Christamas Feast! I'm sure there are many vegans out there who breeze through the holiday season without any issues, of which I am not one. I can still remember my first year as a vegan, Halloween came around and all the leftover sweets were in the office. All I could do was stare in awe at the mound of Snickers, Almond Joys, Kit Kats, Three Musketeers, Twix and various other candy bars strategically placed near my desk tempting me. One of my co-workers wives is an excellent baker and prepares something for the office every holiday. I can laugh at the situations today, but back then it was a true test. Since then I've discovered many of my childhood favorite candies are vegan, like Swedish Fish, Sour Jacks, Dots, Chico Sticks and Now and Laters. Company pot-lucks are another story, fortunately my office rarely has them. What about desserts? I have mastered many types of cookies, such as chocolate chip, ginger, oatmeal, molasses, and peanut butter. Apple pie, peach cobbler, coffee cake, pumpkin muffins, cupcakes and many other desserts are easily veganized, not to mention cholesterol free. You can't have Thanksgiving or Christmas without Turkey, Stuffing/Dressing, Green Bean Casserole, Biscuits, Gravy, Macaroni and Cheese, Collard Greens, etc! Everything listed can be easily veganized. A quick search on the net can get you plenty of vegan recipes for a mock turkey loaf or a Tofurky Roast can be purchased from your Local Health Food Store. In my opinion the hardest to substitute on the list is the Macaroni and Cheese. I have yet to find a vegan cheese that comes close to the real deal, there are recipes that can get you the creamy texture but the cheese-like taste can take a bit of getting used to. Have a Wonderful Holiday Season!!!!!!!!!!!!!!! I grill my Tilapia whole. You can usually buy whole tilapia from your African or Asian market. You can have the fish gut, scaled and cleaned right in the store. Make three slits crosswise on both sides of the fish. Soak fish in cold salt water for about an hour or overnight, if you have the time. Pat dry and then use a brush to rub a marinade of oil, fresh garlic, lemon juice and crushed peppers on both side of fish. Keep some of the marinade to apply during latter part of the grilling process. Using the Broil setting in your oven, place fish on a well oiled rack with a pan under it for drainage. If you chose to use a grill, make sure rack is well oiled to prevent sticking. As fish cooks you may want to brush on more of the marinade mixture. Cooking time for tilapia is approx about 10 minutes on each side. 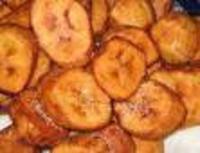 Remove skin from plantain by cutting the tips off both ends. Run knife down length of plantain to open skin, then pry skin off with your fingers. Warning: plantains cannot be peeled by hand like a banana. warning: If this is your first time frying plantains, it is better to stay close by so that plantains don't burn. Transfer golden brown plantains on plate covered with paper towels to drain off excess oil. I am really looking forward to Thanksgiving this year. I have all these great ideas and I can't wait to make them happen. 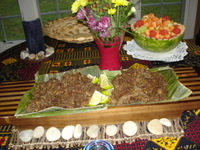 As I mentioned before, Thanksgiving in my house is all about fusion, Africa meets East & West. 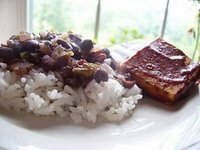 Some of the dishes we are sure to have will be 2 different types of rice - I will have recipes from some experts made available in my next post; Fried Plantains - delicious and simple to make; I'm thinking I may grill some Tilapia Fish and smother it in spicy sauteed spinach, hmm.... 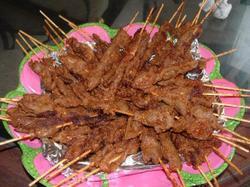 I'm thinking we will have the famous West African Suya - and yes I will tell you how you can get some of that too. Fall is here and it's time to start thinking about the holidays and cooking. 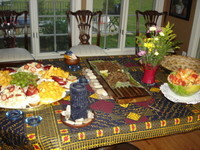 Thanksgiving in the West African home is a fusion of American and African traditions and it makes for some really interesting dishes. 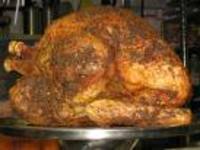 Like in most American homes there is always the traditional turkey, but it's turkey with a twist. In my house we season our turkey with Jamaican Jerk Spices and Smoke it. Oh baby, talk about taking turkey up a notch or two. One of the many things I love about the summer is the abundance of fresh fruits and vegetables at my local Farmers market. Just looking at the vast array of fresh produce inspires me to put a new spin on some of my old recipes, not that I really use recipes. I have a good friend who has an awesome herb garden. Every week she brings me bouquets of fresh basil, thyme and sage. One sniff of this fragrant bouquet gets my creative juices flowing. With fresh veggies and herbs, it's almost impossible to produce a bad dish. Because the ingredients are so fresh and sweet, they make even the simplest dish dazzle. I really don't know what to call this dish but It's a combination of ground turkey, lamb also works well, seasoned with herbs and spices and sauteed with onions and garlic in a large pan. In a separate pan, I added a combination of blended fresh tomatoes, onions, peppers and herbs into hot olive oil. Cooked for about 20 minutes, then added slices of egg plant. Finally I added sauteed meats and covered pan and allowed to simmer so the eggplant could get soft. I love fresh okra, so I chopped up okra and threw it in to cook for the last 5 minutes. The okra was not gloppy or slimy. I served the dish on a bed of Jasmine Rice. The whole family loved it! I love desserts, but not just any desserts. 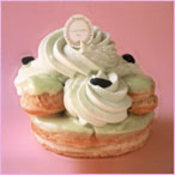 I am most partial to beautifully made French Pastries. 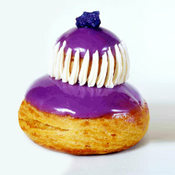 I came across Laduree while reading an article on npr. "Every day, on the most beautiful avenue in the world, Ladurée creates the products that have made its reputation: macaroons, sweets, pastries and other desserts. With passion and talent, 45 pastry chefs and 40 cooks prepare traditional and festive dishes that demonstrate their know-how and their creativity." I have added Paris to the list of places I must visit in the next 2 years, and when I am there I will be sitting down to coffee and dessert at Laduree. .